Despite the wet and windy weather we had a great time watching the Vuelta al Pais Vasco. Typically, the weather was fine both before and after the race. With this year’s race falling after Easter, I thought I’d have no problem booking our usual hotel in Getaria. Sadly, there was no room at the inn and I had to look elsewhere. That’ll teach me to give it glowing reviews on booking.com! Instead, I decided to head for the hills and picked a hotel slap bang in the middle of the race’s parcours. 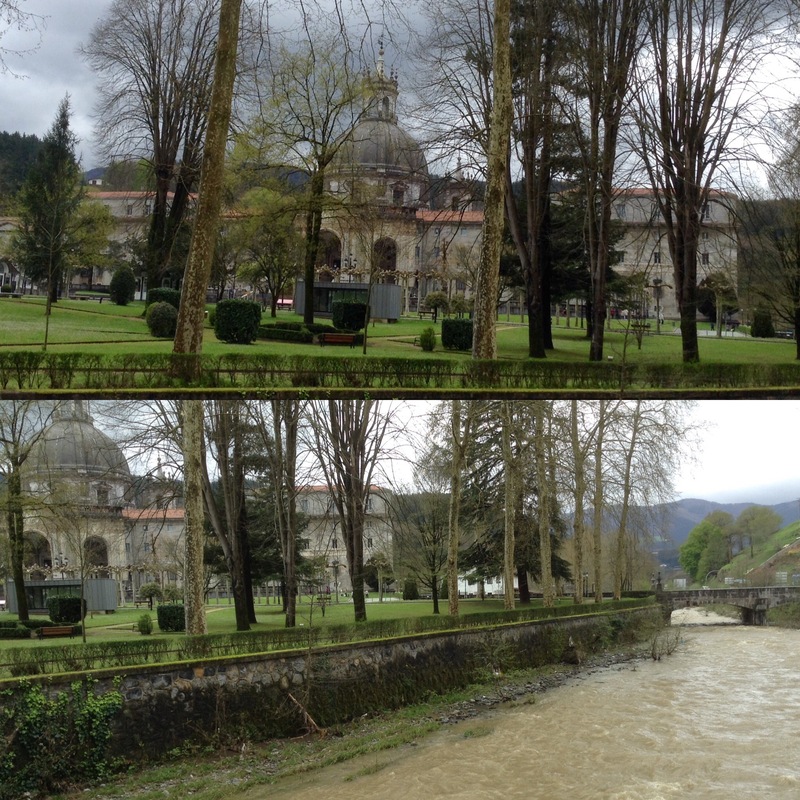 My beloved said I’d found possibly the wettest spot in the entire Basque country – no mean feat! However, he also agreed it was a wonderfully relaxing place with a fabulous restaurant and great WiFi. We typically go the start and finish of all the stages but this year there was no WiFi available in any of the press rooms which posed rather an issue for us. On the wetter stages, we watched the riders set off, found somewhere for lunch and then headed back to the hotel to work and watched the stage conclusion on the television. Usually, we eat lunch in the press room but the lavish pintxos buffets were much more modest this year. I like to think that savings made on the press pack were expended on better safety measures for the riders. In any event, it gave us an opportunity to try out a number of restaurants’ midday menus which are typically 11-15 euros per head for three courses, including wine, water and coffee. I fared well, though I often had to skip dessert, with plenty of mixed vegetable platters, salads and assorted fish dishes. I even found a restaurant in Lesaka which served a quinoa salad! 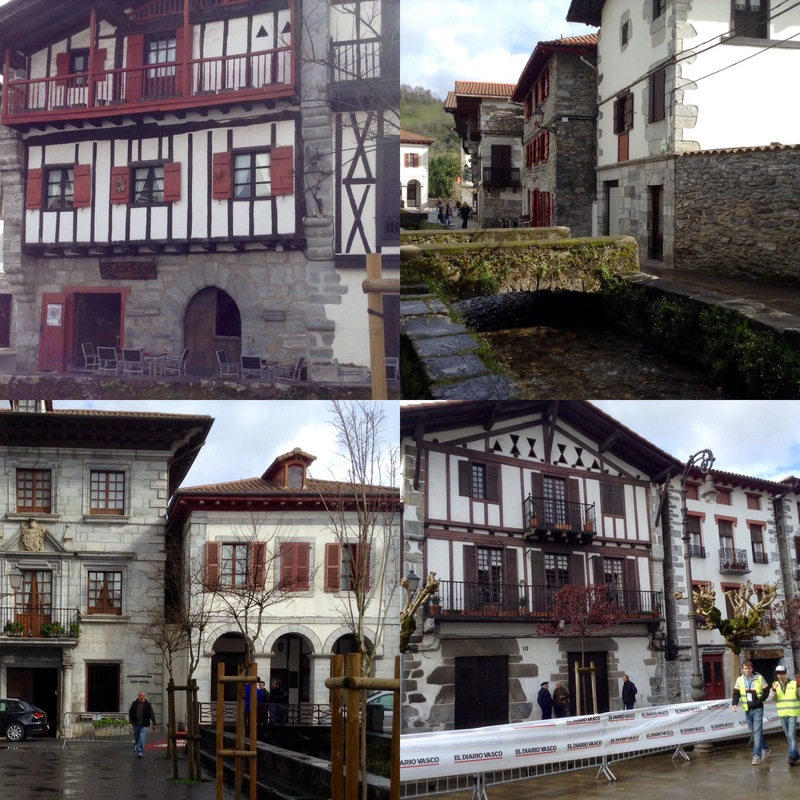 This year’s race visited regular stage venues such as Etxebarria, Markina-Xemein, Vitoria-Gasteiz and Eibar with a couple we’ve not previously visited during the Vuelta such as Lesaka (in Navarre), Orio (a fishing village just outside of San Sebastian) and Gerrastatxu (a new summit finish). That said, we did spend a memorable vacation in Orio a couple of years ago and welcomed the opportunity to reacquaint ourselves with the town. 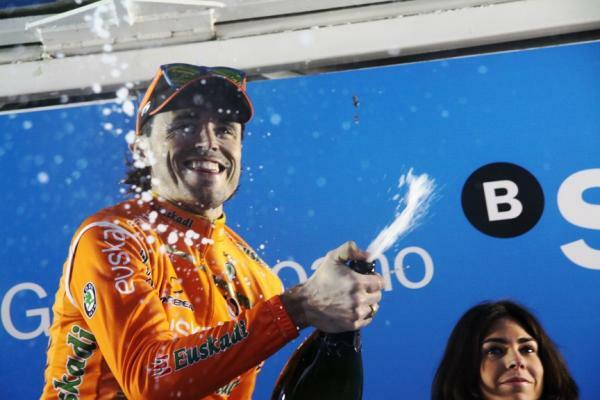 This year’s edition of the Vuelta al Pais Vasco seemed particularly tough and, of course, the biting cold weather and rain made it even more treacherous. Tension was maintained until the final stage, a hilly time-trial won by Alberto Contador who also took the overall. 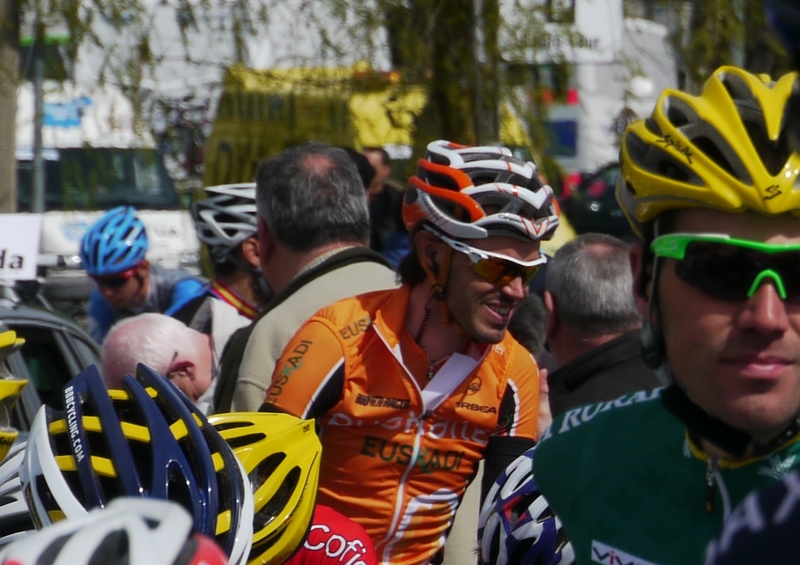 He’s a very popular figure in Spain even in the Basque country where they have plenty of their own riders to support. He delighted the crowd by saying he might not retire at the end of the year. 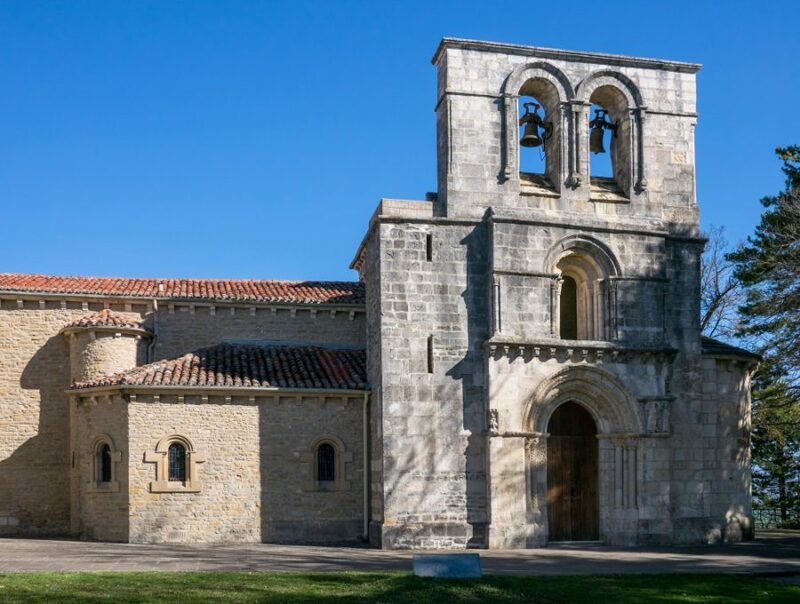 On our travels we also visited a couple of new places, such as Tolosa and, in particular, Azkoitia and Azpeitia with their magnificent churches and basilica, many honouring Inigo de Loyola, the founder of the Jesuits. 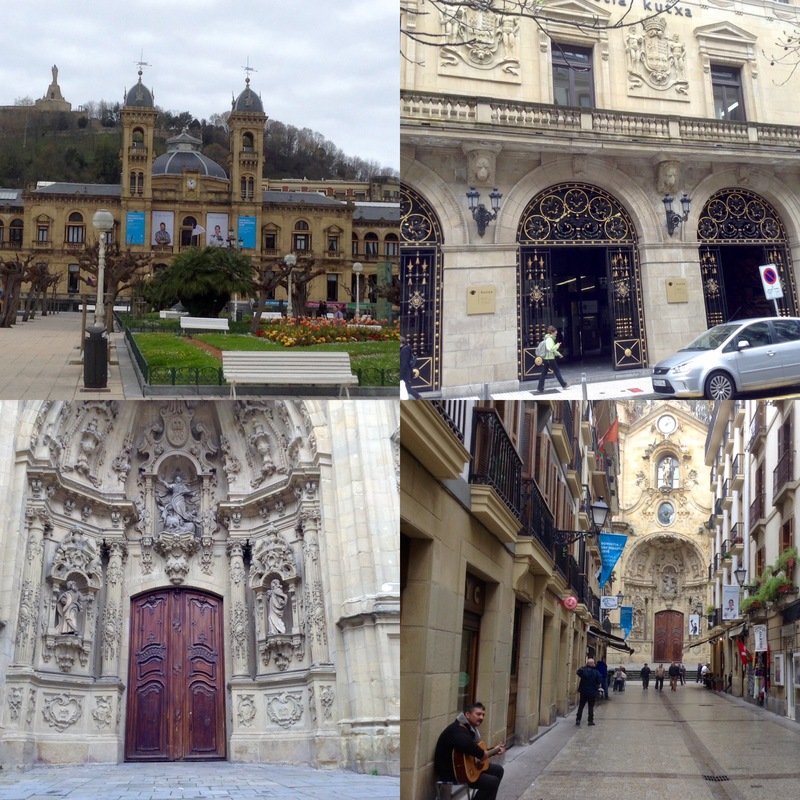 We also found time to have a quick wander around the old town of San Sebastian, to which we’ll return at the end of July for the Clasica San Sebastian. But that’s not all. We’ll have a third visit to the Basque country, to Bilbao, in early September during the Vuelta a Espana. My beloved has double-booked himself again! This happens more times than you might imagine despite him keeping a detailed diary. I can only conclude that he gaily accepts all and any invitations without first checking his agenda. This time he’s told a client he’ll go to an exhibition in Singapore which clashes with our departure for the Tour of the Basque country. After last year’s horrific weather he did say he wouldn’t be coming this year. However, when I made the hotel bookings last November he affirmed his attendance. We’re now looking into options as to how he can join me in the Basque country. His oversight does however have an upside. 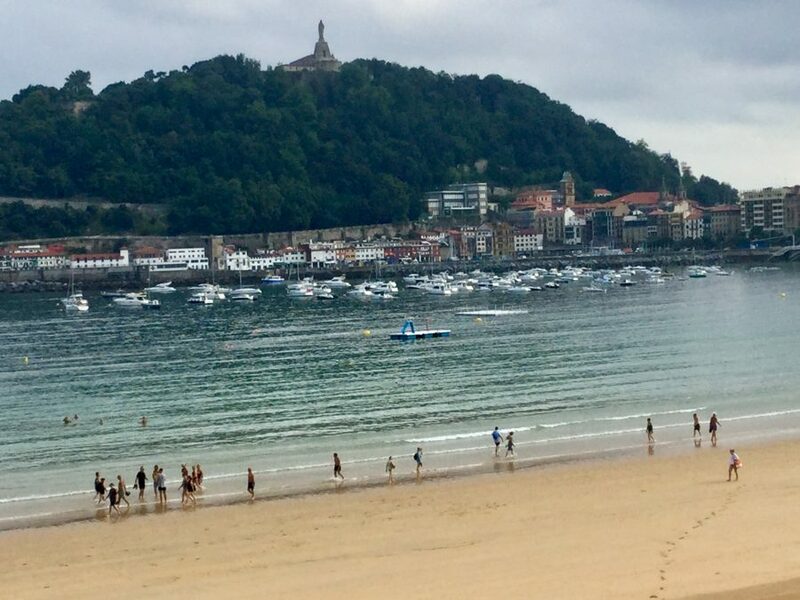 Freed from the restrictions of having to fit in with his ever-changing timetable, I can now drive down to the Basque country at my leisure, leaving when I want and stopping en-route where I want. A whole new world of possibilities has just opened up and it’ll also give the recently acquired Tom IV a good run out. Meanwhile, I’ve been looking at possibilities for my beloved. The best option seems to be a routing via London Heathrow, followed by a day or two working in London, before hopping onto an evening flight to Bilbao where I can collect him. This means I should have anywhere between 3-5 days flying solo. Time to make plans. Typically my beloved will arrive back from a business trip several hours before we leave on holiday. This way he just pitches up and everything’s been done for him. Not for nothing is he known as “The man who just turns up”! If he’s flying long-haul, I’m always concerned whether or not the flight will be on time. And, if not, whether it’ll dismantle our my plans. This did happen on several occasions when we were living in London, despite our proximity to the Heathrow Express service at Paddington. This has occurred much less often in recent years largely because we live so close to Nice airport and most of our holidays are now undertaken by car. Nonetheless, I have taken the precaution of checking that my beloved has all the key dates for 2014 writ large in his diary: the last week of the Giro d’Italia, the first week of the Tour de France, the Clasica San Sebastian, the World Championships in Ponferrada. That’s right, pretty much all our holidays revolve around one cycling event or the other. I wouldn’t have it any other way, nor would he. It’s taken us to some marvellous spots, we’ve met tons of interesting people and made some lasting friendships. Vive le cyclisme! View from my bedroom window! Pretty much like the riders, when you’re following a race, your days follow a very similar format. Turn up at the start 90 minutes before the off which, weather permitting, enables you to catch up with the riders and take photographs. It’s always easier if the team buses are parked close to the sign-on which isn’t always possible in some of the smaller towns. However, once the weather deteriorated, this became a bit of a logistical nightmare with the riders, understandably, not wanting to spend a moment longer than necessary in the freezing, wet conditions. Luckily, the weather doesn’t dampen the appetite of the fervent Basque fans who line the ascents in their hundreds and thousands. The peloton departs and we race to our car or, in this case, our rented Renault Kangoo, to drive to the finish. We head first to the press room to bag our places, set up our laptops, enjoy the plentiful buffet and chat with a few of the photographers and reporters. Then it’s time to check our email and start writing up the summary of the day’s racing as it starts to unfold on the tv screen. When the peloton’s 10km from home, the press room empties, everyone races to the finish line and listens to the two-handed Basque-Spanish commentary team, awaiting the arrival of the riders. Race over, we drift to the podium to congratulate and photograph the winners, then it’s back to the press room to finish the day’s report, download and edit the day’s photographs. Job done, our thoughts drift inevitably towards dinner. We were staying in a charming family-run hotel close to a national park, in a town with a couple of restaurants and bars, one of which was excellent and where we ate most evenings. We didn’t manage to work our way through the menu as we often opted for the day’s specials. A relaxing glass of Rioja and we were both tucked up in bed, fast asleep, well before most of the riders. Towards the end of our break, we popped in to see the owners of the hotel where we stayed last year. We couldn’t stay there this year as it was fully booked! I knew I shouldn’t have written them such a glowing review. We were greeted like long-lost family members and the welcome and cooking was as warm and as good as we remembered. Given the dreadful weather conditions, my beloved is suggesting we opt for the Tour of Turkey next year. I’m not so sure. 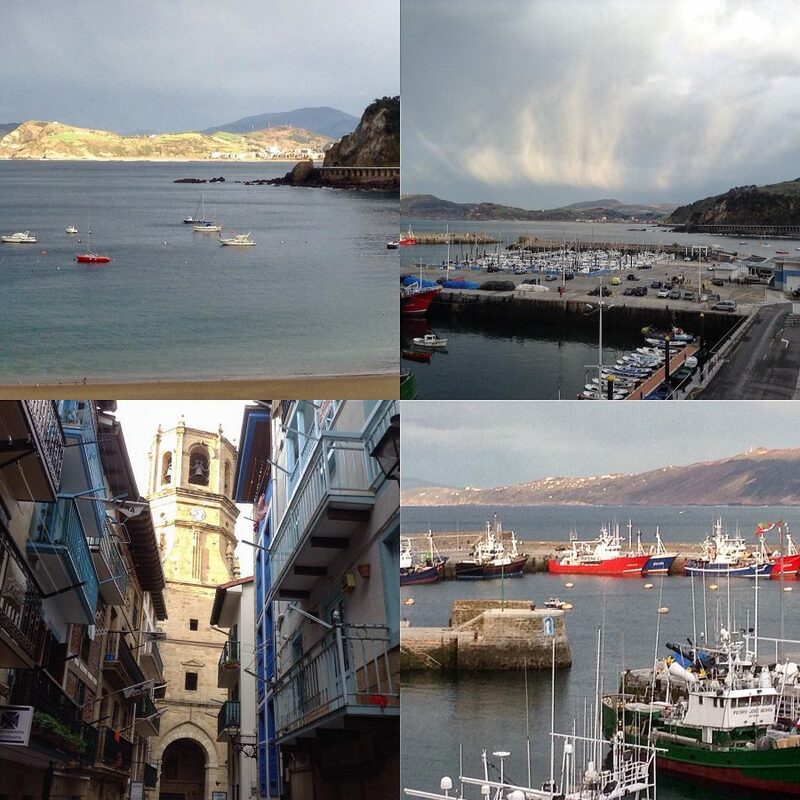 I really enjoy our sojourns in the Basque country and am already looking forward to our next trip at the end of July. I know, I’m back home and I’ve not sent my postcards! We’ve all done it, haven’t we? But, to be honest, it’s the first time I’ve had any real opportunity to write about the trip and not the race which you can read about over on VeloVoices. Well apart from the shenanigans with the Russian visa application. First up the weather was initially much better than anticipated meaning my beloved was able to ride for the first few days and I even accompanied him despite his unerring ability to find every steep climb in the neighbourhood. Admittedly that’s not difficult in the Basque country although this time he succeeded in finding one or two of the longer, more taxing climbs. Of course, when I say I rode with him, I meant I trailed behind him. My beloved, despite our lengthy marriage, constantly fails to appreciate that if he runs, skis or cycles with me I’ll make an effort to keep up. Disappear 500m or more up the road, leaving me to my own devices, and I’ll amble along admiring the countryside or get into conversation with other cyclists. As a result, we rarely cycle together. The first Saturday morning dawned bright, albeit overcast, after Friday’s torrential downpour,and my beloved wasted no time in hustling me out the door though, half-way into our ride, the heavens opened again and we turned tail and fled back to the warmth of our small family-run hotel. In the afternoon we drove into Navarre to watch the GP Miguel Indurain where conversely the weather was dry with a chilly wind. The race weaves loops around the pretty old town of Estella where, after a truly magnificent lunch, we exhorted the peloton, surprisingly split into a multitude of small groups up the final climb. Sunday morning we opted to further explore the countryside on two wheels. The sun shone although there was still an early morning nip in the air. The scent of word-burning fires, the bright lime-green shoots on the trees, the blossoming hedgerows, the sound of dogs barking and the tinkle of bells around the necks of goats and sheep gave everything a distinctly alpine feel but then we were riding at around 600-900m and some of the hills still had traces of snow. I love riding in the Basque country where cyclists always seem to outnumber the motorists who keep a respectable distance and toot in a friendly and encouraging fashion as you labour up yet another of those steep, sharp inclines. Sunday was no exception and we saw many groups from the local cycling clubs, I even cycled and chatted with a few of them after being abandoned by my beloved. Ride over, we settled down to a plate of tapas, a glass of red wine and, on the big screen, the rigours of racing over the cobbles in Belgium. 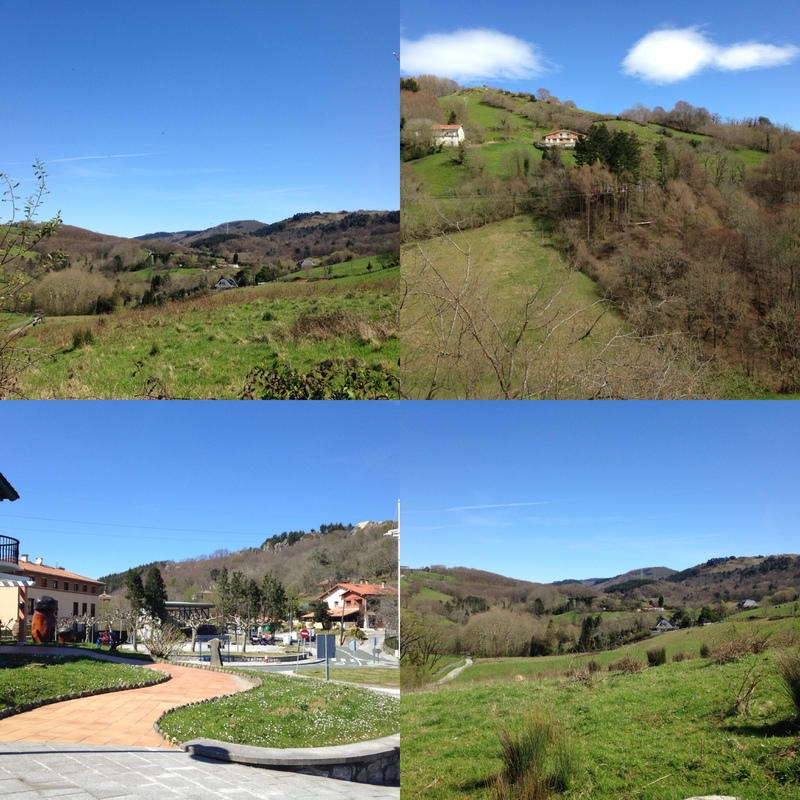 Monday dawned bright and fair, again contrary to expectations, as we headed over to Elgoibar and the start of one of my favourite races of the year: the Vuelta al Pais Vasco. Accreditation secured, we headed to the team presentation and sign-on where I was able to catch up with a number of friends who were riding in the race. There’s nothing nicer than watching and encouraging someone you know. Our early start also gave us an opportunity to catch up with friends old and new in the press corps. This race is extremely well attended by the bike loving Basques. 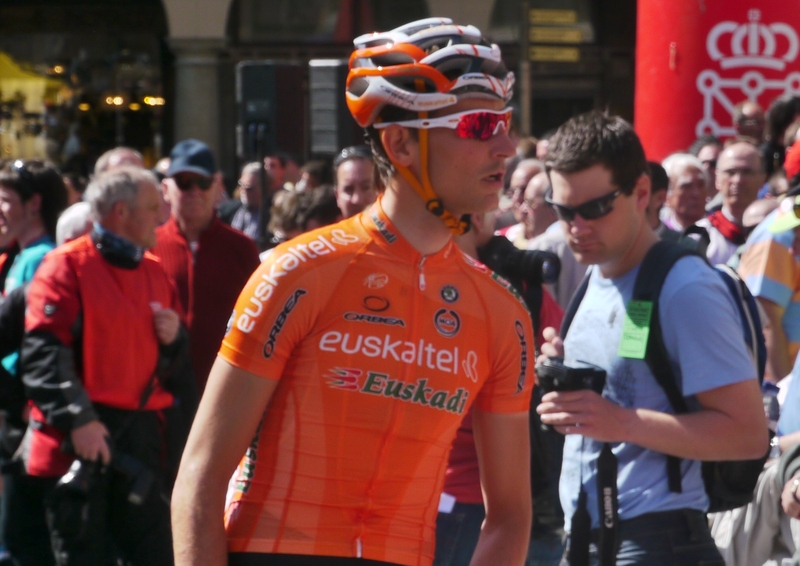 The biggest cheers, not unnaturally, are reserved for the “home” team of Euskaltel-Euskadi and their lead rider and defending champion Samu Sanchez who obligingly had his photograph taken with hordes of dark-haired, dark-eyed moppets: inspiring the next generation. It’s also very evident that former winner Alberto Contador is popular with the on-lookers. The appreciative and knowledgable crowd also welcomes “old friends” such as Jens Voigt who was awarded a plaque in recognition of his support of this race. Conversely, Sky turning up with only six riders, and failing to attend the team presentation, was seen as disrespectful. As the race progressed, they made a point of arriving more punctually for the sign-on except for their gregarious bearded Basque Xabier Zandio who was an early starter most mornings. By the time they started winning stages, they were forgiven. I love watching the pre-start interaction with everyone milling around the team buses in the hope of catching a glimpse of one of their heroes, a souvenir or two or just checking out the bike bling. Likewise those five minutes or so before the race starts where some riders wait patiently, composing their thoughts before the day’s challenges while others chat with their compatriots on other teams, no doubt comparing their experiences of the previous day’s racing. Sadly my plans to ride some of the Tour of the Basque country course have gone awry. We arrived in Estella on Friday evening, dined well and enjoyed a good night’s sleep to awake to yet more glorious sunshine. We decided to ride a couple of the loops of the GP Miguel Indurain, catching the race both en route and as it passed through the town. I also rode up to the summit finish twice, please note the peloton only had to do it once! Sunday, also dawned fair but soon turned grey and overcast. 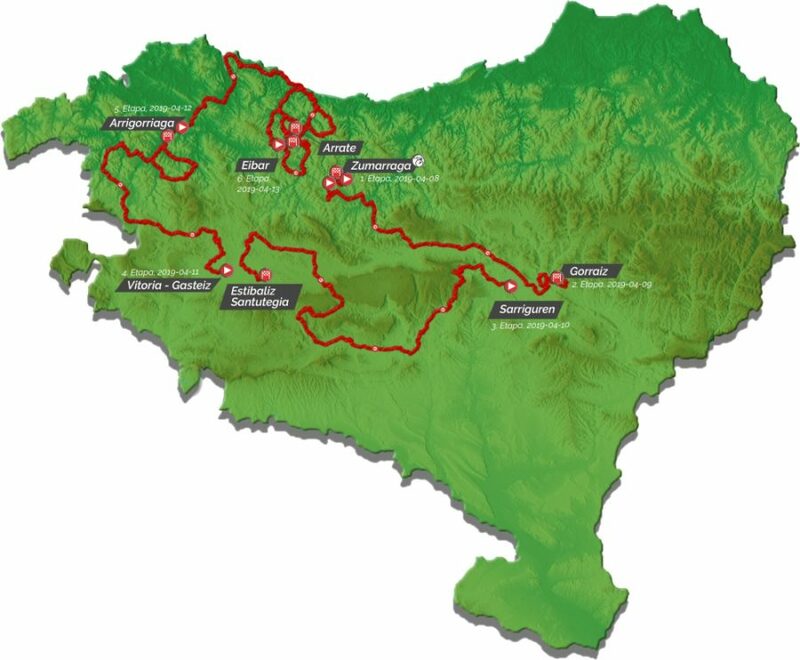 We were now in the heart of the Basque country, ideally placed to view each of the start and finishes of the six stages in the Tour of the Basque country. Undaunted, we muffled up and rode out, heading due north. I hadn’t been riding for long when my bike went “kerrching”. Never good news. I stopped to discover I had broken a spoke on my rear wheel. Initially, I wasn’t too concerned. Every small town here has a bike shop. Surely, someone would be able to fix it? A quick search on the internet revealed a large bike shop on the outskirts of Bilbao which we could visit en route to the following day’s stage, finishing and starting in Guenes, 20km south-west of Bilbao. The shop took the wheel and suggested I call back later. My beloved elected to ride some of the day’s course while I spent an enjoyable day bombing around the Basque countryside, in the warm sunshine, in the company of my friends, Dom and Susi,who were taking photos for Cycling News. At the stage’s conclusion, we headed back to the bike shop. They hadn’t managed to find the requisite parts but suggested I leave it in their tender care for another day. I was happy to do so though rather chafing at the bit to get back into the saddle. managed to find the requisite parts but suggested I leave it in their tender care for another day. I was happy to do so though rather chafing at the bit to get back into the saddle. I rang the shop the following morning and they confirmed it would be ready for collection that evening after stage two’s conclusion in Vitoria-Gasteiz. This is a place I’d seriously underrated on my last visit there during the Vuelta. The stage had finished on the town’s outskirts, today we saw its delightfully charming old town. When we returned to the bike shop, it was to bad news. They’d been unable to source replacement spokes for my Campagnolo wheel. Undeterred, I decided I would have a chat with the men from Mavic the following morning. It just so happened that I’d previously met one of the Mavic guys at Paris-Nice. I turned to him for some words of wisdom before the start of stage three. He basically told me that the wheels were a bugger to fix and he couldn’t help me. I’m assuming that’s a technical term. He advised I carried spares in future – noted. I then turned to see which of the ProTour teams were sporting similar wheels. A couple of the guys at Movistar had the same model but in view of the fact they were fiddly to fit, and knowing how hard the mechanics have to work, I decided not to ask. Though I did keep looking longingly at anyone who had a bike the same frame size as mine and my beloved had to keep admonishing me to step away. In any event, it’s rained pretty much solidly for the last four days. So it’s doubtful I would have actually ridden even had I been able to fix the wheel. My beloved has been out most days, only to come back as mud-spattered as a cyclo-cross rider – thank heavens I bought plenty of kit with us. The washing machine will be going into overdrive on our return! For my previews and reviews of both races head on over to VeloVoices. Yes, I’m dragging my beloved away for a few days’ vacation: my beloved and our bikes. We’re heading down to the Basque country to watch the GP Miguel Indurain and the Tour of the Basque country. 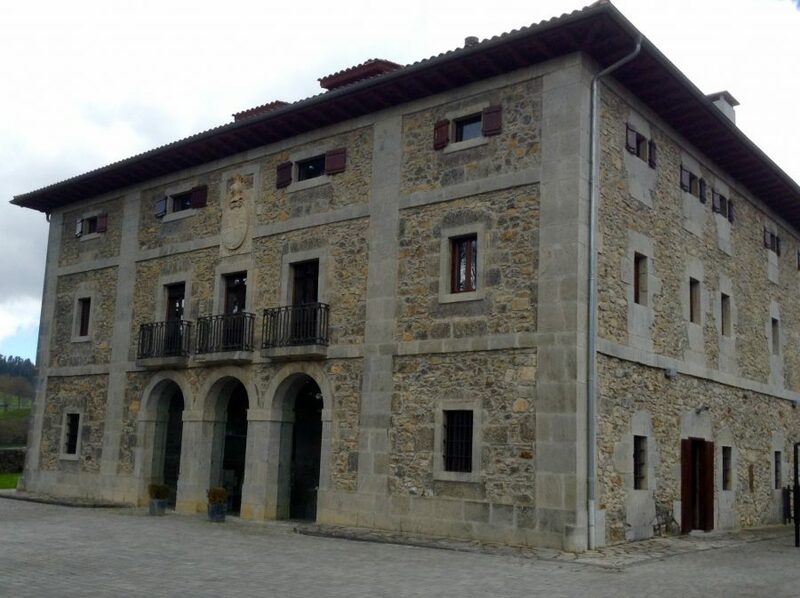 I had originally planned this as a solo road trip where I was going to sign up for some Basque cookery classes but soon appreciated that this would be challenging to achieve given the route of the Tour. So the cookery classes went by the wayside – another time perhaps! As my trip clashed with Easter, it seemed a bit churlish to leave my beloved behind. His wishes have been accommodated, free WiFi at our destination hotel. Apart from that I have our days mapped out. We’ll be riding some of each day’s parcours before and after watching the riders sign on for the stage and then we’ll be catching the day’s finish. The weather looks fine although it won’t be as warm as this week which has been somewhat exceptional. Conscious that I’m heading to a green and pleasant land I’ll also be taking my wet weather gear. Apart from our cycling gear, we don’t need to take too many other clothes. This makes packing relatively simple. Rather than hiring a car we’re taking Tom III who’ll be literally stuffed to the gunwhales but not too stuffed that we can’t bring back a few goodies. I’m thinking ham, wine, cheese which we can pop into the cool bag. The car is clean, full of petrol, tyres checked and ready to go. All our packing has been done, just need to slip in the electric tooth brushes tomorrow morning. The only thing missing is my beloved. He’ll be winging his way back from London this evening. He tends to make a speciality of returning just before we go away. This ensures that everything will have been done for him, all he has to do is turn up. I have had a few wobbly moments when he’s done this in the past and either missed his plane – occurrences far too frequent to enumerate – or it’s been delayed. Rather than try and return the same day as we leave, I now insist he returns the night before. A small but sensible precaution. We had our first downpour in ages yesterday afternoon and evening, but already it’s starting to dry out. By mid-day, I’ll be off out on the bike for a ride. The good weather is set to return for the finale of this week’s Paris-Nice. Last year, sadly, it was a race to the rain and we all felt miserable huddled in the VIP caravan watching the race unfold on the screen. Not as miserable as the riders, many of whom crashed on the rain slicked roads. Crashes which compromised their seasons. A significant number were also taken out with pulmonary infections robbing them of crucial racing and training kilometers. In this year’s race, it started to rain towards the back end of Sunday’s short individual time trial. The conditions no doubt affected those riders and their results, but they didn’t suffer for too long. Yesterday, they were treated to a couple of deluges and they came home mud spattered, cold and wet. The washing machines in the team buses would have been working overtime yesterday evening. Today’s forecast shows low temperatures but probably no rain which will be a welcome relief after yesterday. The weather should improve as they travel further south. When my beloved returns from Canada (four days of peace and quiet), we’re going to drive over to Sisteron on Friday, ride some of the parcours and watch the race finish. We’ve been to Sisteron a number of times and it’s lovely cycling around there. We’ll do the same on Saturday morning before bidding the peloton farewell. We’ll then drive back to watch the finish. I haven’t yet decided whether to watch on the Col de Vence or head to the finish on the Promenade, or attempt both. My beloved will miss Sunday’s time-trial up Col d’Eze as he’s heading to Bordeaux for a meeting the following morning. I’ve already warned him he’ll have to make alternative arrangements to get to the airport. Tom III and I will be otherwise engaged. More cycling related good news: the GP Miguel Indurian, the Vuelta al Pais Vasco and Clasica San Sebastian have all been saved, for now. I am of course delighted as my two holidays this year have been planned around these very races when I shall again be riding some of the parcours and watching the racing. 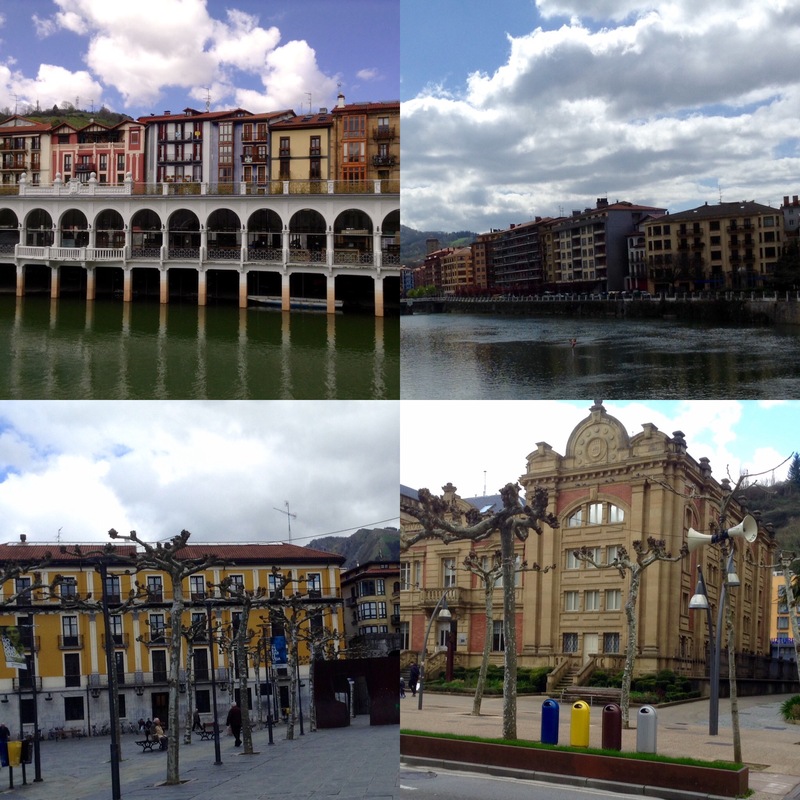 Our first trip, over Easter, will give us an opportunity to explore the Basque country between Bilbao and San Sebastian. One of the advantages of watching the Tour of the Basque country is that it takes place in quite a small geographic area. There’s no need for the teams, or us, to change hotels and the finish is within easy reach of the start. This will enable us to see the sign-on, drive to the finish and the cycle some of the route before watching the riders arrive across the finish line. We’ll need to do plenty of cycling to burn off the calories we’ll be consuming in the Basque restaurants. We won’t this time be going on a trawl of Michelin starred establishments, instead we’ll be seeking out “neighbourhood” restaurants. I shall still need to take care however so as not to set my regime back ahead of my forthcoming season of sportifs. Yesterday’s big story was the (one assumes) accidental leaking of next year’s Tour de France route ahead of its official launch next week. ASO have neither confirmed nor denied that it’s the correct route but for those of you requiring confirmation, just try and book an Accor hotel at any of the start or finish towns. My beloved and I had already decided that next year, for the first time since 2006, we would not be watching any Tour stages live. Although it’s possible we might make it to Paris to watch the final stage. Now, that’s not to say that I wouldn’t do a day trip to watch a stage. The closest one for me would be that allegedly on 14 July from St Paul Trois Chateaux to Le Cap d’Agde. However, there’s no way you’d find me willingly on the roads at the start of the French holiday season where traffic jams reach nightmare proportions, particularly on routes leading from Lyon. 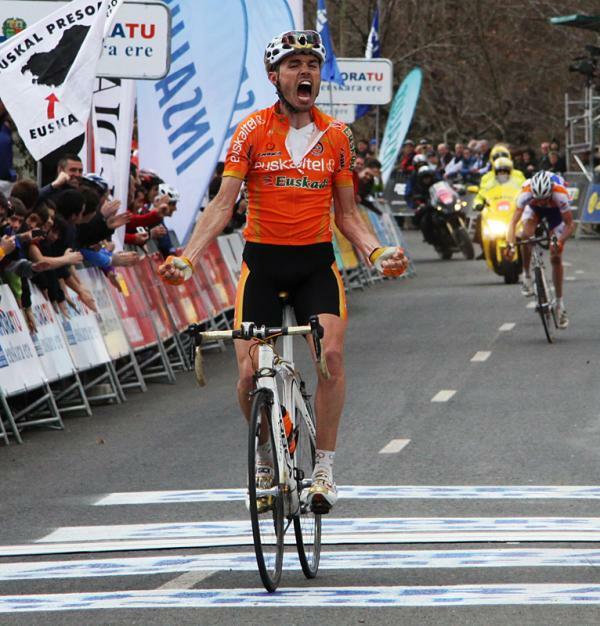 So 2012 well might be a Tour de France free year. Yes, that’s right, I’ll just watch it all on the television. I am however hoping to make it to both the Giro (at long last) and the Vuelta. In fact my programme is shaping up quite nicely with the early season races such as Tour of Med and Tour of Haut Var, followed, of course, by Paris-Nice and Milan- San Remo. I’m then hoping to spend a week in the Basque Country watching the Tour of the same name, and the GP Miguel Indurain, while fitting in a cookery course. This clashes with the start of the cobbled Classics, but a girl can’t always have everything. Details of the Giro’s course which starts next year in Denmark have also been leaked. The stage to watch is the penultimate one but, as it clashes with the Kivilev, you know where I’ll be and it won’t be up the Stelvio. I’ll have to make do with watching it on my laptop. However, the stage starting in Savona on 18 May is a real possibility. After the Giro, I’ll either go and watch the Tour of Switzerland prologue in Lugano or maybe take in a couple of stages in the Dauphine, depending, of course, on its route: southern Alps Yes, northern Alps No. There’s still a huge question mark over whether I’m going to London to watch the Olympic road race and time-trials. Without tickets the former might be a logistical nightmare while the ticket-free latter very crowded. I will however be heading back to Spain for the Clasica San Sebastian and the Vuelta. I’ve already made my hotel booking for the World Championships in Limburg where my trusty steed and I will be riding around the area, and the course. Booking early ensures I get a 4* hotel, at a reasonable price, with free WiFi and parking in central Maastricht. I had toyed with the idea of spending this coming week end in Varese to watch the Tour of Lombardy, particularly as the weather’s so fine. 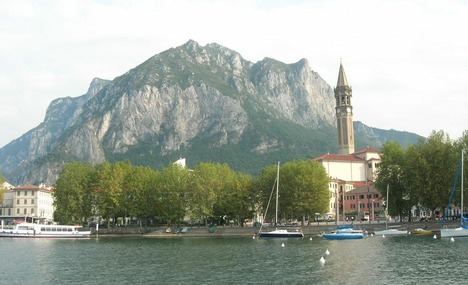 But this year’s finish is in Lecco, some 41/2hrs from home, rather than Como, so again, I’ll be watching it on the television. Maybe, next year. A couple of years ago my husband and I drove down to Barcelona on business by way of Girona. We both agreed it looked a good place to cycle and promised ourselves that one day we would return. 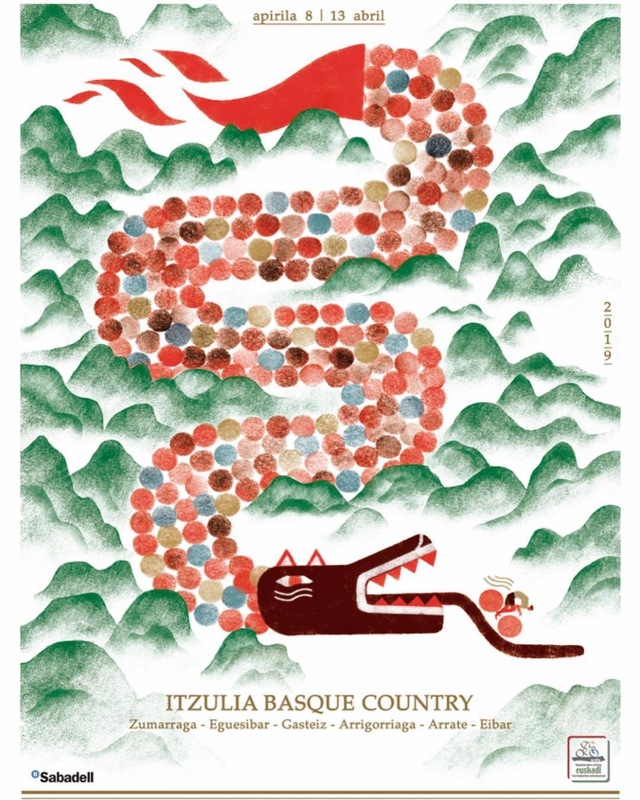 This week I’ve been watching the Tour of the Basque Country and, again, I’ve found myself thinking, fabulous countryside, great place to cycle, must pay it a visit. 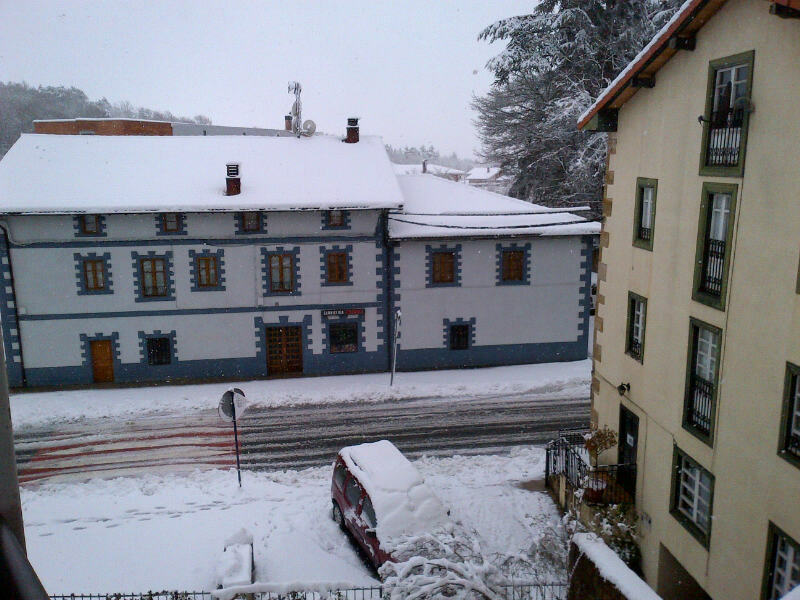 So I’m wondering whether a cycling tour of northern Spain might be on the cards for next year. My one problem is logistics. I would love to cycle from one place to another but who’s going to carry my luggage? Please don’t suggest I get panniers. I’m not starving myself to loose 10kg only to replace that weight with panniers. There must be another way. A cycling club trip perhaps? Too far, the club likes to cycle to its holiday destination. I appreciate that there are holiday companies who organise such trips but I don’t want to cycle with a crowd, just my beloved. I can see further research is required. Meanwhile, one of my favourite Spaniards won yesterday. Sadly, having dropped from GC contention on Day 1, Sammy Sanchez needed a stage win to appease the fanatical Basque fans who line most of the climbs at least 10-deep. It was a marvellous display of both ascending and descending from the Olympic champion, almost matched by Valverde, who finished second and snatched back the yellow jersey from Oscar Freire. Joaquin Rodriguez showed he’s on form for the forthcoming Ardennes classics by storming up some vertiginous climbs today to catapult himself onto the podium. Everything is finely poised for tomorrow’s hilly 22km time trial which retraces some of the steeper climbs of today. Horner is in 2nd place, just 1 second down on Valverde, Rodriguez is 3rd and lying in 4th place is former mountain-biker, Jean-Christophe Perraud, current French time-trial champion. Of course, no mountainous stages would be complete without some dodgy descending. 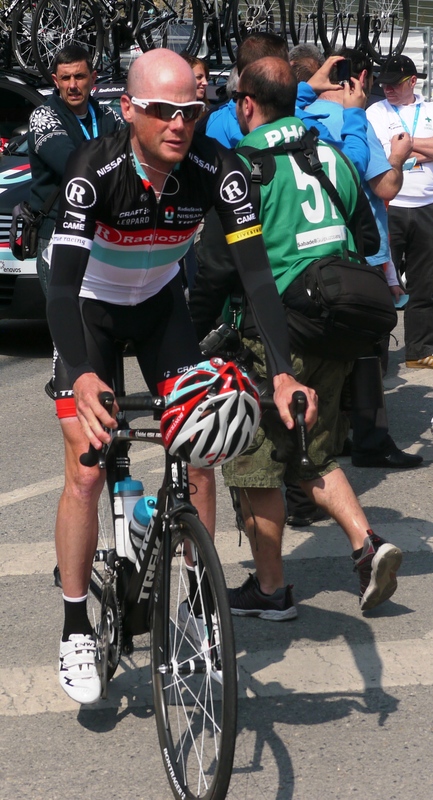 First up, Schleck the Elder, a man I would not wish to follow down any descent. I understand he flipped over a barrier yesterday and didn’t start this morning. Today, Amets Txurruka attempted a curve from the wrong apex and went down heavily. Fortunately, I understand neither are badly injured. Robert Gesink also fell today and has now slipped down the GC and out of contention. Il Falco (Paolo Savodelli) should give master classes in descending to those (and there’s plenty of them in the peloton) who struggle to ride as well downhill as they do either on the flat or uphill.